A result of 17 years of unappreciated work - Aina Mahal or the Palace of Mirrors was built by master craftsman Ramsinh Malam, after he personally requested the royal court of Bhuj, Gujarat for work. Built in the 18th century, this palace is an art in itself, with numerous rare paintings and collectibles around the world. Aina Mahal was built in an Indo-European style under the rule of Lakhpatji. Aina Mahal is a 18th century palace is designed in Indo-European style and is a wonderful specimen of mirrorwork and glasswork. Aina Mahal is located next to the Prag Mahal. It is located in the heart of Bhuj, near Hamirsar lake. Explore the facade from outside and notice the intricate carvings. 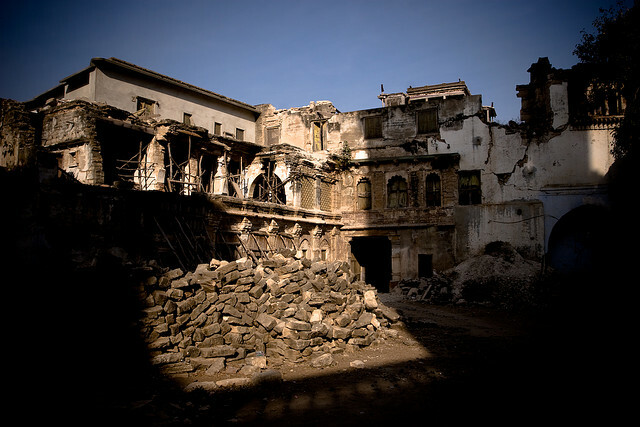 The palace is in ruins now, however, because of the 2001 earthquake.